The primary objective was to identify usefulness of homoeopathic medicines used in centisimal scale and fifty millesimal potencies in the treatment of warts. 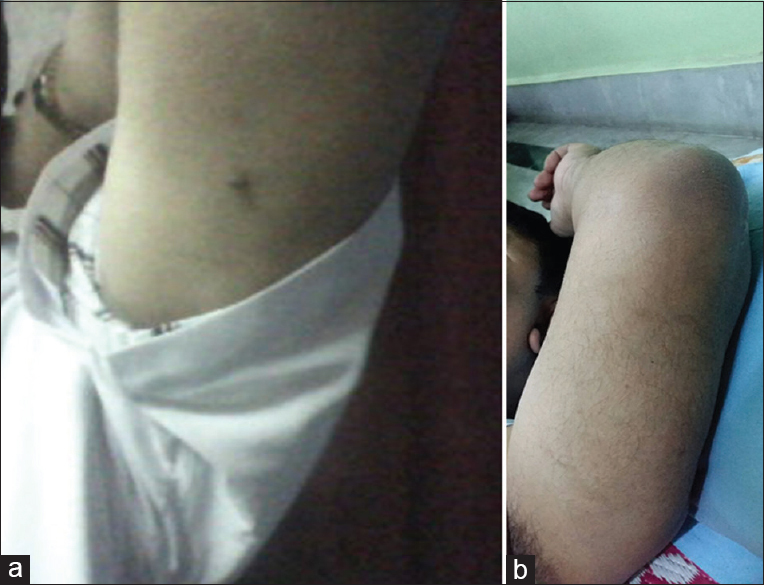 A 44-year-old man presented with a single small wart on the lateral aspect of the left arm. In this case, two doses of Thuja -CM were prescribed, and he was advised to take the medicine every morning on the empty stomach. On the 2 nd visit, the patient reported that improvement was observed and the wart had decreased in size. The treatment was continued with a placebo. Finally, the wart dissolved in about 1 month and 3 weeks [Figure 1]a and b. Reappearance of the wart is not reported even after 4 years 7 months of treatment. 2nd visit on September 19, 2012: Size of wart decreased, patient was prescribed Placebo. 3rd visit on October 03, 2012: Size of wart further decreased, patient was prescribed Placebo. 4th visit on October 17, 2012: Wart completely dissolved, no medicine was prescribed [Figure 1]b. A 28-year-old male presented with multiple small warts on the tip of nose and upper lip. Pain in the both legs during standing. On repertorial analysis, both "Sulphur" and "Causticum0" have scored highest marks (13) but "Sulphur" covered seven rubrics out of nine whereas Causticum covered six. Among two medicines, " Causticum" is more effective for cauliflower-like warts, especially on the face [Table 2]. In this case, two doses of Causticum-10M were prescribed, and he was advised to take the medicine in the morning on an empty stomach. After 2 weeks, the patient reported that no improvement was observed. Placebo was prescribed after 3 weeks, improvement was observed and the wart had decreased in size. The treatment was continued with a placebo. At last, the wart dissolved in about 3 months. 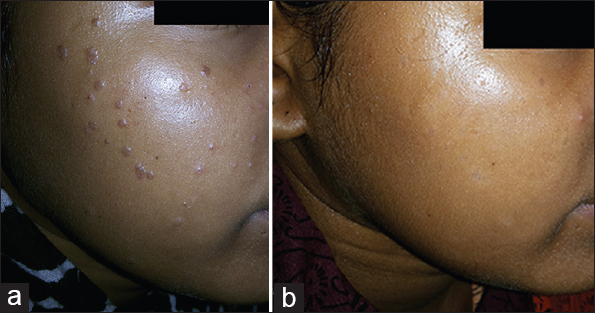 On the basis of repertorisation sheet and miasmatic consideration, the treatment ended with Antipsoric medicine " Sulphur-1M" to avoid reappearance of the symptoms [Figure 2]a and b. Reappearance of warts is not observed even after 9 months of treatment. 2nd visit on May 24, 2015: No improvement occurred, patient was prescribed Placebo. 3rd visit on June 14, 2015: Size of all warts decreased, patient was prescribed Placebo. 4th visit on July 05, 2015: Size of wart (tip of nose) further decreased and warts on the moustache completely dissolved, patient was prescribed Placebo. 5th visit on August 02, 2015: Wart (tip of nose) completely dissolved, Sulphur-1M, 2 doses were prescribed [Figure 2]b. A 13-year-old girl presented with multiple warts on the right cheek. On repertorial analysis, " Causticum" has scored highest marks (9) but " Sulphur" covering most of the rubrics (5 out of 7). It is one of the leading remedy used extensively for dissolving warts. The mental general, physical general and particular general symptomatologies were well covered by this remedy. Hence, the most appropriate remedy for this case was " Causticum" [Table 3]. Causticum - 0/3, 16 doses in 100 ml aqua dist were prescribed and she was advised to take the medicine every morning on the empty stomach. After 1 week, the girl reported that most of warts were subsided, and within 2 weeks, all the warts were subsided. In this case, fifty millesimal potencies were chosen; hence, the full and quick recovery occurred [Figure 3]a and b. No recurrence has occurred even after 1 year and 9 months. 2nd visit on August 31, 2014: Most of warts were subsided, patient was Advised to take rest of the doses. 3rd visit on September 07, 2014: Rest of warts were completely subsided, patient was prescribed Placebo [Figure 3]b. 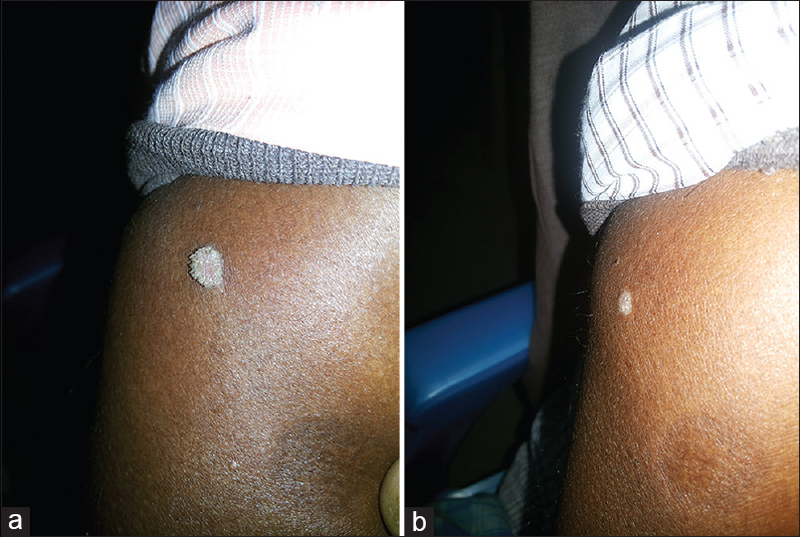 A 50-year-old patient presented with a single small wart on the lateral aspect of the right arm. Dreamt of police coming to arrest him. On repertorial analysis, both " Thuja" and " Nitric Acid" have scored highest marks (14) covering most of the rubrics (7 out of 12). In this case, symptom showed that the patient had hydrogenoid constitution and strong prominence of sycotic miasm. Therefore, Thuja was most suitable remedy for this case [Table 4]. Thuja - 0/3, 16 doses in 100 ml aqua dist were prescribed and he was advised to take the medicine every morning on the empty stomach. After 2 weeks, he reported that the wart was decreased in size and finally within 3 weeks of treatment, the wart completely disappeared. [Figure 4]a and b. Reappearance of the wart is not reported even after 1 year 5 months of treatment. 2nd visit on December 28, 2014: Size of the wart decreased, Thuja occidentalis - 0/5, 16 doses were prescribed. 3rd visit on January 03, 2015: Wart was completely subsided, patient was advised to continue the rest of the doses [Figure 4]b. 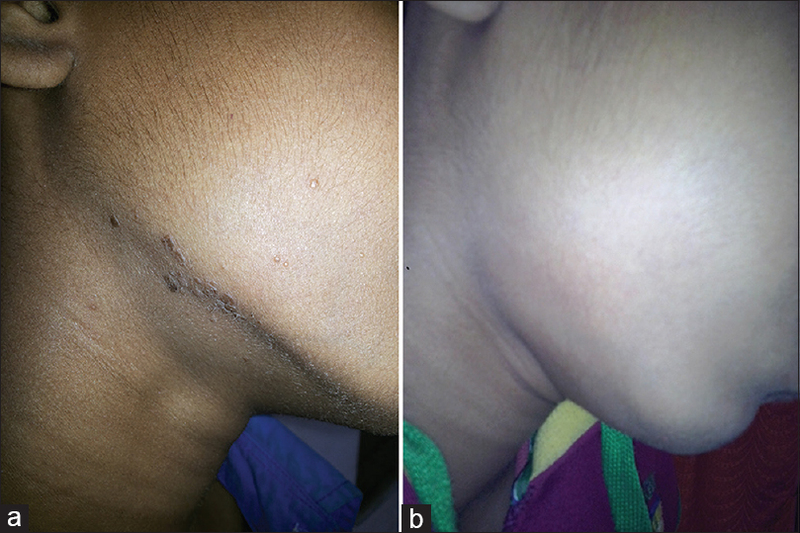 An 11-year-old boy presented with multiple warts on the face, especially on the right cheek. Numbness on the both leg occasionally. On repertorial analysis, " Causticum" has scored highest marks (10) covering most of the rubrics (4 out of 5). The mental general, physical general and particular general symptomatologies were well covered by this remedy. Hence, the most appropriate remedy for this case was " Causticum" [Table 5]. Causticum - 0/3, 16 doses in 100 ml aqua dist were prescribed and he was advised to take the medicine every morning on empty stomach. After 4 weeks, the boy reported that the warts were completely dissolved also informed that he forgot to take medicine at every day and sometimes he took medicine at 1 or 2 days interval [Figure 5]a and b. Reappearance of the warts is not observed even after 1 year of treatment. 2nd visit on May 05, 2015: Warts were completely subsided, no medicine was prescribed [Figure 5]b. In this case series, 5 case studies are presented. In each of these cases homoeopathic medicines were selected on the basis of individualization and these medicines were successful in the treatment of warts causing removal/dissolution of the warts and relief of associated symptoms of the patients. Both Thuja and Causticum have been reported in the literature as useful medicines for the treatment of warts, the selection of which depends upon the presenting totality including other general complaints present in the persons and overall constitution. All the patients continued the follow-ups for the next 6 months to 5 years with no recurrence. No patient complained about the side effects or any negative consequences. In the cases presented here, in 1 case thuja was used in centesimal scale and in the other case, it was used in 50 millesimal scale. Causticum is used in 3 cases, in centesimal scale in 1 case and 50 millesimal scale in 2 cases. On comparing duration of illness with improvement outcome, it has been observed that in cases treated with fifty millesimal potencies, the response to treatment was faster. It is therefore suggested that studies can be undertaken to ascertain comapritive role of centesimal and 50 millesimal potencies in treatment of warts. The present cases bring to light the effectiveness of fifty millesimal potencies in the treatment of warts. In future, randomized controlled trials with larger sample size may be undertaken for validation of the results. Sterling JC, Handfield-Jones S, Hudson PM; British Association of Dermatologists. Guidelines for the management of cutaneous warts. Br J Dermatol 2001; 144:4-11. Shaikh MI. Homoeopathy at a Glance - What is Homoeopathy; July, 2012. Available from: http://www.similima.com/homoeopathy-at-a-glance. [Last cited on 2012 July 15]. Master FJ. The Bedside Organon of Medicine. 2 nd ed. New Delhi: B. Jain Publishers (Pvt.) Ltd.; 2001. p. 4-20. Abarna S, Venugopal J, Sivaranjani T, Poruthukaren KJ, Raj P, Suresh S. Evaluating the usefulness of 50 millesimal potencies in the treatment of chronic diseases - A restrospective study. Indian J Res in Homoeopathy 2015;9:96-101. Boericke W. Pocket Manual of Homoeopathic Materia Medica & Repertory. Reprint. 9 th ed. New Delhi: B. Jain Publishers (Pvt.) Ltd.; 2002. p. 181, 520, 643. Allen HC. Allen′s Keynotes Rearranged & Classified. Reprint. New Delhi: B. Jain Publishers (Pvt.) Ltd.; 2006. Banerjee DD. A Text Book of Homoeopathic Pharmacy. Reprint. New Delhi: B. Jain Publishers (Pvt.) Ltd.; 2005. Das AK. A Treatise on Organon of Medicine. 5 th ed. Calcutta: Souvik Homoeo Publishers; 2002. p. 1-35. Banerjea SK. Miasmatic Prescribing. 2 nd ed. Germany: Narayan Publishers; 2006. p. 189-250. Hahnemann S, Boericke W, Krauss J. Organon of Medicine. 6 th ed. New Delhi: B. Jain Publishers (Pvt.) Ltd.; 2003. Choudhury H. 50 Millesimal Potency in Theory and Practice. Reprint. 3 rd ed. New Delhi: B. Jain Publishers (Pvt.) Ltd.; 2000. p. 3-15.